In the springtime scramble for best advantage in the Tony Award nominations, the producers of the musical Shuffle Along, currently running at the Music Box Theatre, insisted that it compete as a revival rather than a new musical. Their undisguised motive for seeking this designation for a show derived from a nearly century-old revue was to avoid going head-to-head with that jubilant Broadway juggernaut known as Hamilton. Who can blame them? But the ploy didn’t work: Officials for the Tonys (which Hamilton swept on June 12) denied the request, reasoning that while the new musical incorporates some of the 1921 songs by Noble Sissle and Eubie Blake, the show’s current director, George C. Wolfe, jettisoned the original book about a mayoral election (an expansion of a long-standing comedy routine by the vaudeville duo Aubrey Lyles and F.E. Miller, appended to an operetta-style love story) and created a wholly new one. Wolfe’s own subtitle concedes that the Tony panel was right. 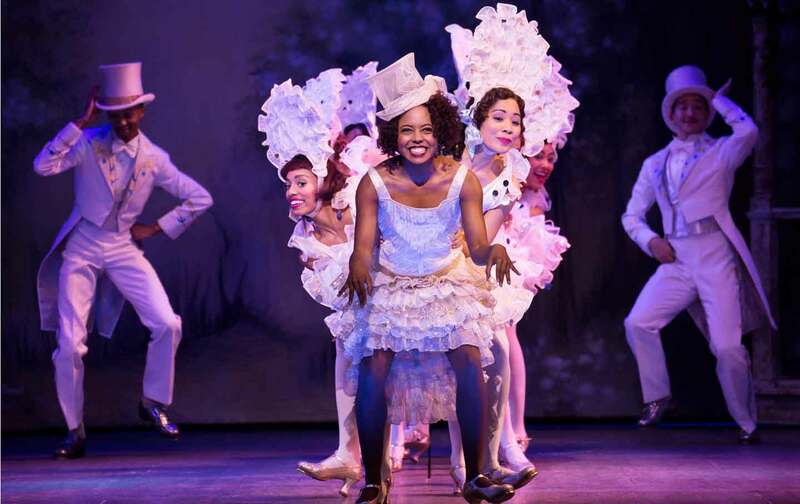 He calls his show Shuffle Along, or The Making of the Musical Sensation of 1921 and All That Followed—and, indeed, it buoyantly tells the backstage story of the show’s creation, success, and aftermath with an astonishing all-star cast. But the Tony judges were also at least a little bit wrong: Rather than a new musical in the typical sense, Wolfe’s Shuffle Along belongs to an as-yet-unnamed but growing and revelatory category of theatrical works that investigate contemporary issues by reconfiguring old hits, now largely forgotten or deemed no longer stage-worthy. The writers who refashion them seem to work from a profound love for, even infatuation with, their source material—and also with some discomfort issuing from the material’s historical context. Another such work, Indecent, by playwright Paula Vogel and director Rebecca Taichman (currently running Off-Broadway at the Vineyard Theatre), is woven around Sholem Asch’s 1906 Yiddish domestic tragedy God of Vengeance. These plays are far different from straight-up revivals, or even from the adventurous reboots that, say, set Richard III amid 1930s fascism or place South Pacific in a war veterans’ rehab center. With their freshly written scripts, they are distinct, too, from adaptations that offer a new spin on a core plot and set of characters. Rather, they are plays about the plays that are partially embedded within them. They present some elements of the source material, but they also step outside it to comment on its genealogy, process, reception, performance style, impact—and, perhaps most of all, on the issues it raised that still make our culture itch. Though these are new plays, the old ones inhabit them like dybbuks. Call them repossessions. To some degree, these plays share a sensibility with recent archival fiction by writers like Danielle Dutton and Marlon James that, as Lucy Ives recently wrote, are set in the past, yet deviate from historical novels because they don’t give readers “the imagined experience of an event,” but instead “offer the ambiguous traces that such events leave behind.” As Ives notes, such novels unfold from competing perspectives, often delivered in multiple voices. In the theater, where a single narrative voice is usually already absent, or at least contested (there’s no such thing as a reliable narrator onstage), point of view isn’t so much the question for these repossessive plays—though they, too, don’t simply depict the past, but address how our sense of it has been fashioned. Instead, logically enough, representation itself is at issue here: who and what can be shown onstage, live and in person. In the American context, because it involves bodies, this often means the ways in which racial and sexual difference can be displayed and asserted. Both the original Shuffle Along and the Broadway production of Asch’s God of Vengeance (on the boards within a year of each other) faced potential scandal over a love scene that tested the limits of such representation. This is also true of another important repossessive play, Branden Jacobs-Jenkins’s An Octoroon, a hilarious and piercing framing of Dion Boucicault’s 1859 melodrama about the thwarted love between a plantation owner and a slave, which ran at the Soho Rep in 2014 and again at Theatre for a New Audience last year. From the days of those melodramas well into the 1920s (at least), anxious reaction to racial and ethnic assertion was often disguised as a concern for sexual propriety—and vice versa. Shuffle Along also changed the sound of Broadway, and popular music more generally. Thanks to Blake and Sissle’s jaunty numbers, syncopation vaulted into scores all over town. Wolfe stages another great illustration of how innovation happens with “(I’m Just) Wild About Harry,” in which McDonald’s Lottie Gee rejects the tepid three-quarter time of the song’s first draft: “Give it to Mary Pickford or Marilyn Miller because I will not be singing a waltz in my long overdue Broadway debut.” She summons a dancer (Lil’ Baby C) for an improvised duet and transforms the tune with new accents. Before our ears, it turns into the familiar hit. Act I of Wolfe’s musical ends with the opening-night performance of the original Shuffle. Having persevered through a lack of funds, grueling out-of-town tours, and racist indignities, these kids-putting-on-a-show secure their triumph. It’s thrilling: One spectacular performance after another inundates the stage in a tsunami of talent, exuberance, and pride—the principal singers, a barbershop quartet, and the dance corps in a rafter-shaking tap extravaganza. It’s Wolfe at his most exultant. And it’s a hard act to follow. The second half, tracing the falling out among Shuffle’s creators and their inability to repeat their tremendous success, goes slack by comparison. There’s much less to root for: Wolfe provides (perhaps invents) a romance between Blake and Gee (he’s married, so it will never blossom) as a narrative spine, but it’s too brittle to hold up the action. The other characters flail. Lyles flirts with Garveyism and departs for Africa, leaving Miller in the lurch (and exits with the show-stopping, 11-o’clock number, “Low Down Blues”). As if rushing to fit everything in before the closing moments of the show’s two-hour-and-40-minute run time, the creators take declamatory shots in Act II at the real injustices that the great artists of Shuffle endured because of racism—a point clearly dramatized in Act I—but steer clear of some of the internal contradictions and unnerving elements of the show’s history. Though we see Lyles and Miller “cork up” for their comic routines, there’s little investigation of that discomfiting performance tradition and the subversions some black artists brought to it; and Wolfe left out songs and characters with names like “Uncle Tom and Old Black Joe.” (These are the kinds of sharp thorns that Jacobs-Jenkins giddily throws himself into headlong in An Octoroon.) In a solo tap number, Wolfe makes the glib and hyperbolic assertion that George Gershwin stole the first four notes of “I’ve Got Rhythm” from William Grant Still, a Shuffle band member and composer in his own right—a charge that stands in, no doubt, for the general white appropriation of black creativity. None of this takes away from the excitement of the sparkling spectacle, though, as Wolfe resurrects Shuffle right down to its basic weaknesses: a thin book and a baggy second act. His purpose is essentially celebratory, pouring out an impassioned deluge of talent, savvy, skill, and labor. If Eubie Blake had attended God of Vengeance, he might have made the same observation about audiences watching its “offending” love scene, the one that beats fervently at the heart of Vogel’s Indecent: a seduction between two women frolicking in the rain. In this case, scandal did ensue. On Broadway, that is. As Indecent recounts—in a visually and aurally poetic style that incorporates a three-member klezmer band whose tunes (by Lisa Gutkin and Aaron Halva) twine beautifully through the action—Asch’s drama played in Yiddish as Got fun nekome all over Europe and on the New York stage to great acclaim. Heavily influenced by Maxim Gorky’s unblinking realism, the play tells the story of Yekel, a brothel keeper who tries to buy respectability in his community and a dowry for his scholarly son-in-law by commissioning a copy of a Torah scroll. Before the marriage can be celebrated, his daughter Rivkele runs off with Manke, a prostitute in Yekel’s employ. At the end of 1922, the play enjoyed a successful run in English at the Provincetown Playhouse in downtown Manhattan and was transferred to Broadway a few months later. There, the cast was arrested on charges of obscenity. God of Vengeance enjoyed a surge of interest in the late 1990s after decades of neglect, partly in response to the rising appreciation for modernist Yiddish works (as distinct from the sentimentality long—and falsely—associated with the language), and even more thanks to a growing effort to recover forgotten gay and lesbian texts. The playwright Donald Margulies wrote a sensitive adaptation, moving the setting from 1906 Poland to the Lower East Side in the early 1920s, thus heightening the tensions over assimilation and advancement and addressing a specifically American audience. Otherwise, productions of the play latched on to the relationship between Rivkele and Manke (no small thing, to be sure) but had little idea how to deal with the rest of Asch’s work, which is schematic, melodramatic, and awash in Jewish tropes lost on most audiences. By repossessing the play, Vogel and Taichman mine the meaning in those tropes and demonstrate how the mainstream attack on the play involved not just homophobic censors, but also the Jewish community’s anxiety over its portrayal before gentiles. They also show how the press—as well as the court that tried the actors on obscenity charges—expressed blatant anti-Semitism in their calls for a pure American theater bearing no trace of foreignness or salacious exoticism. While Asch is the protagonist in one of Indecent’s multilayered plots—aging from a hotheaded writer in Poland to a reclusive novelist in the United States to a soul-shattered post-Holocaust Jew hounded by the House Un-American Activities Committee into leaving the country—his play is the protagonist of another. This play-within-a-play is shepherded by a warmhearted stage manager, Lemml (a winning Richard Topol, the only actor among the strong ensemble to play a single, central role; the rest of the eight actors bring some 40 characters to life over the 50-year span of action). As if introducing us to a Yiddish Our Town, he opens Indecent by introducing the acting troupe, all of them seated in a row upstage, rising in the darkness as he beckons them forth. Sand spills from their coat sleeves. In a stunning final sequence, Vogel and Taichman entice us into a heady and hair-raising space of make-believe: pretending that vicious history itself might have been different, even as they trace its violent path. As different as a black musical revue and a tragic Jewish melodrama are from each other, on the Broadway stage of the early 1920s, Shuffle Along and God of Vengeance made similar brave claims for the confident expression of degraded peoples. Other musicals in those years featured titillating and exploitative “jungle” numbers, with black women in banana skirts performing bawdy songs that let African Americans be lascivious but not loving. In dramas, meanwhile, Jews were dissolved into the melting pot in plays like Abie’s Irish Rose and Rosa Machree, intermarriage comedies that held the stage while God of Vengeance was shut down. To assert African-American creative autonomy, Jewish particularity, and lesbian love was to push the boundaries of mainstream entertainment while attempting to resist the rising currents of racism and xenophobia. As Shuffle Along ran through its 484 performances and God of Vengeance took the stage some six months later, race-baiters were fomenting riots and isolationists were demanding heavy restrictions on immigration. The Ku Klux Klan was growing; so was the subscription base for Henry Ford’s scurrilous Dearborn Independent. Now, as the Trump campaign gives new license to aggressive racial animus and anti-Semitic spew, Wolfe and Vogel and Taichman may be tuning our ears to hear such tidewaters rising—and giving us strength.